In Sri Lanka nearly everything has its origins in coconut. Not exactly as exaggerated as the island caricature set forth by pop culture touchstones like Gilligan’s Island’s coconut radio and coconut car, but it is pretty damn close. And cooking with coconut, whether it is coconut meat or coconut milk is a ubiquitous staple. Despite the fact that coconut oil, and many coconut products, have a longstanding bad rap in mainstream, health-conscious, culture, Sri Lankans, as well as many South Asians in the region, subsist off of copious amounts of coconut derived products. As one who has been scared away from coconut, because of its naturally high levels of cholesterol and saturated fat, would presume, any culture eating its weight in coconut oil would probably be plagued with heart disease and a general low mortality rate – not so. Is it possible that what we know, and have been told, about coconut oil and coconut-based products is not the whole truth? According to The New York Times, distinctly coconut oil’s bad reputation caused a panic at the concession stands back in 1994, when the Center for Science in the Public Interest put out a study claiming that a large movie-theater popcorn, hold the butter, delivered as much saturated fat as six Big Macs. This was enough to turn off a good percentage of the population and make coconut oil a big greasy no-no. Nearly two decades on, coconut oil has experienced a bit of a resurgence, as reported by Melissa Clark for The New York Times. Annual sales of coconut oil in the natural food sector have boomed, and this is not because people are searching out a sure-fire way to raise their cholesterol levels. Despite previous reports about coconut oil being the devil riding a tidal wave of trans fats, certain health professionals are touting the many health benefits of coconut oil (everything from weight loss to reducing the susceptibility of developing HIV and cancer). 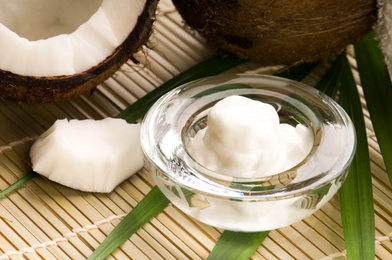 Some of the confusion around coconut oil resides in the initial data. Seems the studies and reports that labeled coconut oil as entirely unhealthy had been done with partially hydrogenated coconut oil, which is high in trans fats, and is known for destroying many of the good essential fatty acids and antioxidants naturally contained in virgin coconut oil (the raw form of the more processed partially hydrogenated coconut oil). Therefore the results from this data branded coconut oil, in general, as something to be avoided at all costs (the ultimate cost most likely be your life). But new research has shown that virgin coconut oil does not possess any of the same qualities found in partially hydrogenated coconut oil, and, while it is a saturated fat, it is actually a relatively healthful and fairly delicious alternative to animal fats and nut oils. Vegans and those with nut allergies are especially enthusiastic because, while virgin coconut oil is nutty and rich in flavor, it is also free of animal products and nut-derived oils. And cooking with coconut oil lends a buttery and near-sweet flavor to just about everything. While this should not give you license to eat coconut oil by the spoonful, it does provide some comfort that this maligned cast off possesses something more than just a bad reputation. Coconut oil is the healthiest oil! Other oil mafia has just defamed and bribed doctors too! Coconut oil is good for many things. It is great for dry skin! I haven't used it much for cooking but plan too try some recipes with it, so nice to know it is healthy and has good benefits. I don't know about the rest of you folks; but I do believe I'm missing something (the point) important with this particular article and have wasted a few moments of my life reading nothing? People can search for recent pics of Sally Fallon, google and youtube to see she does not appear fit and healthy and is over overweight. Youtube "old vegan" and see the alternative to make up your own mind. The best and most complete book about saturated fats, including coconut oil, is "Eat Fat Lose Fat" by Mary Enig and Sally Fallon. I have been using coconut oil for years and it's absolutely marvelous. Plus you won't put weight on it (read the book, it explains why). Also great as a skin conditioner. At least, I know what's in it. It makes a wonderful pastry crust. And perfect for baking, cooking, etc. If you use it long enough, you don't really taste the coconut anymore, you get use to it. Did you know that AIDS patients can go in remission just by drinking coconut milk every day? Another interesting book: "The Coconut Oil Miracle" by Bruce Fife.